London, July 5, 2011 (Global Fashion Wire) - Menswear SS12 Trends. Milan is revered worldwide as an influential hub, boasting a horde of premium designer houses and labels, whilst the city's ready-to-wear fashion weeks are among the most anticipated on the schedule. 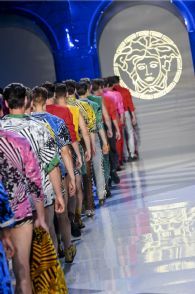 We were in attendance for the SS12 round of menswear shows, pens poised to note down the prominent trends of the season. A suave, jet-set theme spurred various takes on Mediterranean and Riviera looks, as luxury fabrics, relaxed tailoring and muted hues come to the forefront. With the London 2012 Olympics on the horizon, Milan offers a luxe and high fashion interpretation of the abundance of activewear looks set to flood the stores next summer. Elsewhere a soft, late 60s-70s, silhouette added a romantic touch to classic rock and roll looks.